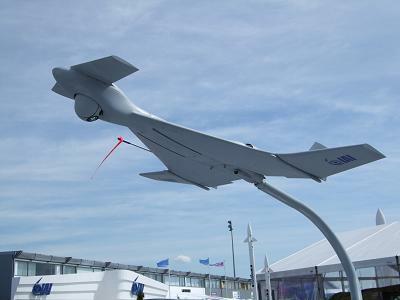 Paris Airshow The Israeli arms industry appears to have stolen a march on that of Britain in the field of "loitering munitions" - aerial surveillance drones equipped with warheads and designed for one-way strike missions. While Blighty pays large sums to develop a partly homegrown example, Israel is already making substantial export sales of its Harop robo-kamikaze. Israeli national aerospace'n'arms firm IAI announced a $100m+ sale to an undisclosed foreign customer last week. The Harop is now on show at the Paris Airshow, and rumour around the arms bazaar has it that the unnamed purchaser nation is Turkey - though there are other theories. Meanwhile, IAI also says that an adapted version of the hammerhead-esque killbird will also be bought by the German armed forces. The Reg spoke yesterday to Joe Weisman of IAI at Le Bourget. Weisman explained that the Harop is a derivative of "the world's first loitering munition that I'm aware of, the Harpy defence-suppression weapon". Harpy was designed to take out air-defence radars - a capability of great concern to the aggressive Israeli air force, known for mounting bombing raids against any target deemed dangerous by the Tel Aviv government no matter where located. Harpy would fall off its carrying aircraft and then fly about waiting for an air-defence radar below to switch on and begin emitting pulses - at which point the Harpy would dive down on the transmitter and explode. Harop differs from Harpy in that it's directed electro-optically rather than by radar. It can be launched from a container on a ground vehicle, firing out of its box on a booster rocket then unfolding its wings and starting up its internal-combustion driven pusher propellor. Once airborne, the Harop can fly about until its fuel is exhausted, transmitting back video to its control station just like a surveillance drone. But "it's a missile, not a drone," says Weisman. If the Harpy doesn't find a target worthy of attack, it can't be brought back and used again. In such a case it would normally self-destruct in midair to avoid unnecessary damage. If a target is found, however, the Harop can then fly down and crash into it with unerring precision, detonating its 50lb warhead as it does so. IAI specifies that "the attack can be performed from any direction and at any attack angle, from flat to vertical which is highly essential in urban areas". Given the German and Turkish (or whoever) orders, it's plain that Harop is ready to go right now, and is well up to the standards of major-nation armed forces. Such "loitering munitions" are a popular concept in many quarters, too - particularly among the UK Royal Artillery, which intends to introduce a loitering munition as the cornerstone of its Indirect Fire Precision Attack (IFPA) programme, a major part of its planned future.